The location of Snape’s death in Harry Potter and the Deathly Hallows: Part 2 has been changed, according to art director Andrew Ackland-Snow (spoilers below). Let us know below which location you prefer! With thanks to SnitchSeeker via HPANA. What the heck? Have you ever heard the saying “Don’t fix it if its not broken”? Don’t kid yourself, Rowling has likely been responsible for cutting back Snape’s role more and more as the movies continue. She hates any of us who like Snape, ever since she found out some of us consider him more heroic than Harry–after all, Harry had people who loved and wanted to help him, while Snape died for people who despised him and left him to rot. She tried to tell people he wasn’t a hero directly after DH came out, only to have to revise her words. Now she’s trying the best she can to make him a nonperson. I doubt very much we’ll ever see that Prince’s Tale flashback; the movie has been set up so Harry can find out anything he needs from the Dumbledore’s portrait. 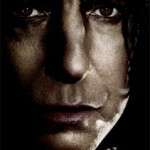 I’ll be surprised if we see Snape’s death at all in the movie. They may have filmed it, but I suspect it’s been left on the cutting room floor, right along with “Don’t call me coward!” Rickman was directed to kill Dumbledore as if he was on Valium. Remember, Harry is the only hero allowed in the films–both Hermione’s and Ron’s parts have been cut to pieces as well (though admittedly they did get quite good bits in DH2). But Snape has never been allowed to be in the films what he was in the books (they also cut out anything bad the Gryffindors ever did in the books, because otherwise people might become quite confused about why they should root for oh, say, the Maruaders or the Weasley twins). Anything about Snape is going to be cut out completely from the movie, I expect. What? Why did they do that? They are tearing him into pieces! “Snape dies in a(n) extremely good way”???? Well, he didn’t! Isn’t that the point? That his life and death were miserable and he still chose to be a martyr? I was so disappointed when he wasn’t even shown longer than 3 minutes in a film that is all about him (Hello, Harry Potter and THE HALF-BLOOD PRINCE!) and now everything that could persuade me to watch that film is Alan Rickman’s performance. I hate that, nowadays, everything has to be overly dramatic even if the story thereby changes. It is all about the story, folks! Especially in a literature-based movie! Get over it people. Rowling agreed. And the films can’t be exactly like the books. Its okey to change some thing to keep the interest or the mystery a movie thats totally the same as in the books isn´t that surprising anymore. I think they change quite alot ( harry and voldemore jumping down from somewhere down) to hold the surprising effect. but to change the location isn´t for keeping the surprise its just not needed. i hope they show enough of his dead and the prince flashback tale because it´s how alot of mysteries and secrets get their reasons! its like the most inportant thing that hold all the books together (or maybe the whole story) if they didn´t but enough from it into the movie they screw it up! its like making a potion and left some of the most important things in it. 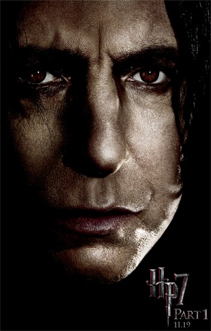 I love snape i´m a big fan of him and when she, J.K. ,wants to make a nonperson out of him she makes a moron out of herself why make him so important in the books to make him so f**ing no special in the movies that doesn´t make any sence! sorry for my bad english it´s not my mothertongue! I think its going to be a brilliant film. It is a shame we wont get to see Snapes death, hopefully we can still see the part were Snape says to harry just before he dies ”look…at…me” I think Snape is one of the most important people in this series and all i can say is i hope we see lots of him in part 2. I also think the boat house is a better location. I have to say though, i am really pleased that they have added in a scene of Snape going to godrics hallow that was a BRILLIANT idea. I can totally relate to some people not being happy with the directors and them changing what happend in the book though. Nobody said they weren’t going to show his death, the boathouse just happens to be a bit more interesting that a dusty and dirty shack. I bet you he’ll probably die in the same way just different location. I don’t think they’ll inherently change how he died, *Spoiler* I still think Voldermort will get Nagini to kill him or he’ll do it himself but I think we’ll still get to see the death. And if Rowling approved the scene she obviously thought it was an acceptable way to end the character, seeing as they are her creations. Sometimes movies are a good way to see how it could have been done differently, for better or for worse. I love Snape. And have been a big fan of the character since book four (before that I was still following the crowd and swearing love to the three main characters). Anyway, from the quote it doesn’t sound like we’re not going to see the scene from inside the boat house. It just sounds like it’ll be a little more dramatic with the camera being able to not only see Snape dying but also see Hogwarts in flames. They can’t really cut the scene because Harry needs Snape’s memories and I know they at least shot one of his memories based on the trailers. It was the one where Lily is making a flower bloom in her hand. Hell, who knows the film scene might be better than the book scene. I know I felt a little cheated (although I still cried). All we can do is hope for the best and prepare our hate mail in case of the worst. I love the character (and actor) Sev Snape, but i absolutely hate the movie makers for cutting his role to such an extent that we only get to see him for atmost 3-4 minutes in the movies, even though he has such a major role to play. And considering what they did to Snape’s worst memory in HP & OOTP, i would actually be surprised if they show even a bit of the Prince’s tale!! I sincerely hope that changing the set would do some good to the character, and is not just used to focus on the burning school or something like that!! I don’t think Ma’am Rowlings’ approval in this case means much! Had it been Harry, Ron Hermione, … or even Lupin for that matter, we could ve assumed that her approval means something good, but knowing that she hates Snape, and hates the fact that many people love him (and i hate anyone who hates Snape :p), we can just not deduce much! Hoping for a little good for the character who deserves much better!! I dont think it will be that bad. lets stop complaining and keep it the way it is. I have no clue what game them the idea to change the place like that. Lets just hope it will be good. firstly, snape is one of the most important characters, harry would be dead if snape didn’t exist and they can’t just cut him out of everything. secondly, by saying snape dies in a boathouse is saying that voldy hangs out in a glass boathouse and, he’s voldy. no way. he’s a bit more ninja than that. but if jk’s fine with it, go on with it. Well, you guys, you have learned your lesson about NOT assuming things that have never been said or anywhere close to said or hinted at or anything. Right? The death scene was pretty amazing. Alan Rickman did a fantastic job and they didn’t cut out anything. I don’t understand how any of you thought they would cut out the Prince’s Tale. It’s a huge part of the story and connecting all the pieces. I mean if you thought that…well that’s just plain stupid. Think things through before you say them and believe them. The scene was great, although it would have been better in the Shack (in my opinion). They stayed true to the book and the dialogue. It was great. Yeah the death scene was excellent. I’m sorry to see that human beings with nervous systems and brains actually thought that they would cut it out. The boat house being the location was a minor change that I think was for the better because if you re-watch the shack scene from the third movie it just wasn’t that great of a locale on film. (although it was a better place in the book.) Also the way that he died was slightly different but it was better and more sensical than the book’s approach in my opinion. Seriously though… pretty stupid for people to think that they would change it that much.